The Chicago Blackhawks may not have won against the Dallas Stars on Thursday night, but there was some good news as rookie sensation Alex DeBrincat did something that no one has done in team history. 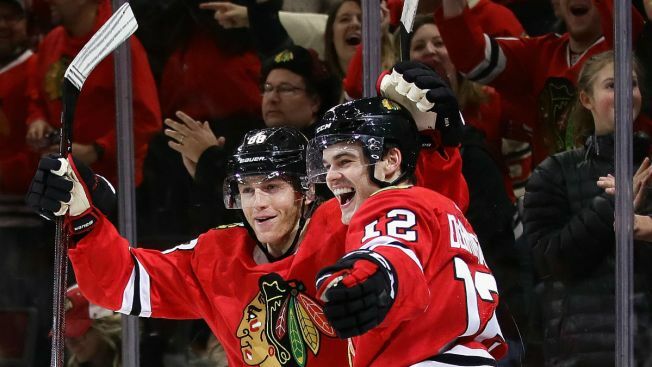 DeBrincat, who was drafted by the Blackhawks in 2016 and broke camp with the team this season, scored yet another goal on Thursday, his 11th of the season and his 10th of the month of November. Not only did the goal tie him for the NHL rookie scoring lead, but it also vaulted him past three notable Blackhawks, and into some rarefied air. According to NBC Sports Chicago, DeBrincat’s 10 goals in November are the most that any rookie has scored in a single month in the entire 91-year history of the Chicago Blackhawks. That number includes his first career hat trick, which he notched on Monday against the Anaheim Ducks, and a two goal game earlier in the month against the Carolina Hurricanes. DeBrincat surpassed Murray Balfour (Jan. 1960), Darryl Sutter (Feb. 1981) and Steve Larmer (Dec. 1982) on that list, as all three players scored nine goals in their respective record-setting months. According to The Athletic's Satchel Price, DeBrincat is also tied with Eric Daze for the most goals through 25 games in Blackhawks history, with 11 tallies. Jonathan Toews had 10 in his first 25 games, and Jeremy Roenick racked up nine. Unfortunately for DeBrincat and the Blackhawks, the goal wasn’t enough, as the Stars pulled off a 4-3 overtime victory.